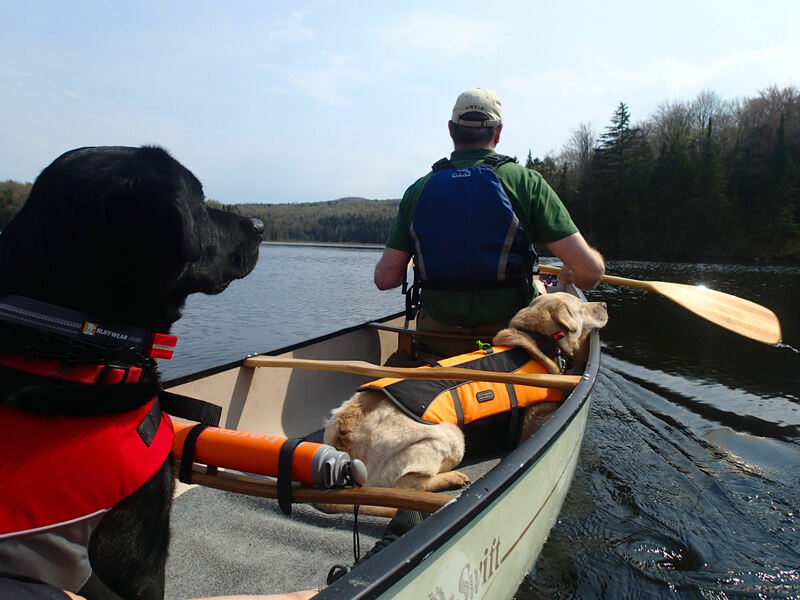 The loons are back on the water… and so are the Paddle Pups! | Vermont Paddle Pups! 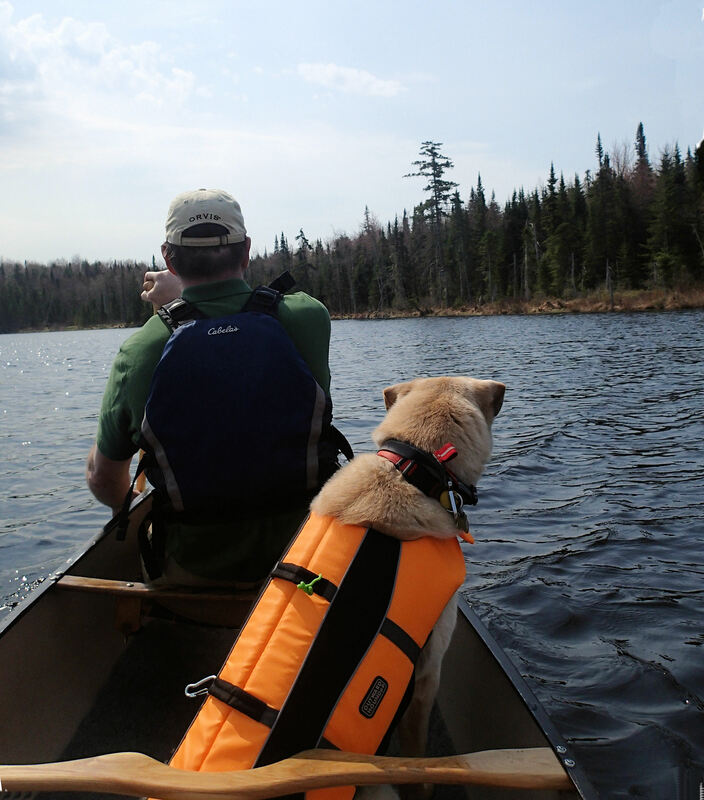 The loons are back on the water… and so are the Paddle Pups! What a great way to start the paddling season! 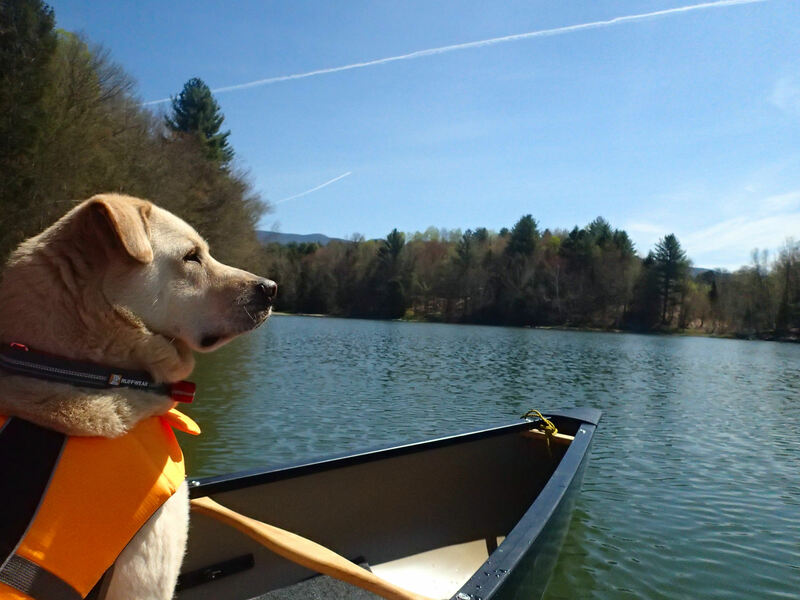 Edgar, stylin’ in his new Astral life jacket…..
What a quick transformation! One week ago, I was using microspikes to negotiate ice and snow while hiking up the Notch….today, we had our second canoeing journey of the year. Amazing what a week of 80 degree temperatures can do to bring on green grass, budding trees, and warming water temperatures. The microspikes have gone back to Kahtoola for “repair or replacement”…maybe I am optimistic, since we have been know to have snow in late May! The snow was persistent this spring…especially at higher elevations…. The past few weeks have been busy ones for us…one of us ( not me) had knee arthroscopy, so our family long hikes have been a bit limited. However, each of the dogs has had quite a great few weeks of hiking with me, exploring all the new smells of spring, splashing in the water in the streams, and having the opportunity to try out some new lower elevation hikes . We have been very antsy for paddling season to begin…the canoe flag was put out on the deck, a little dryland training took place, the canoes were spruced up and treated to get ready for the season, and we were excited to receive our new Astral gear from Get: Outdoors. We tried out the new MSR Pocket Rocket on a breakfast hike, and are pleased to report it was a great success, and we know it will be great for our canoe camping trips! 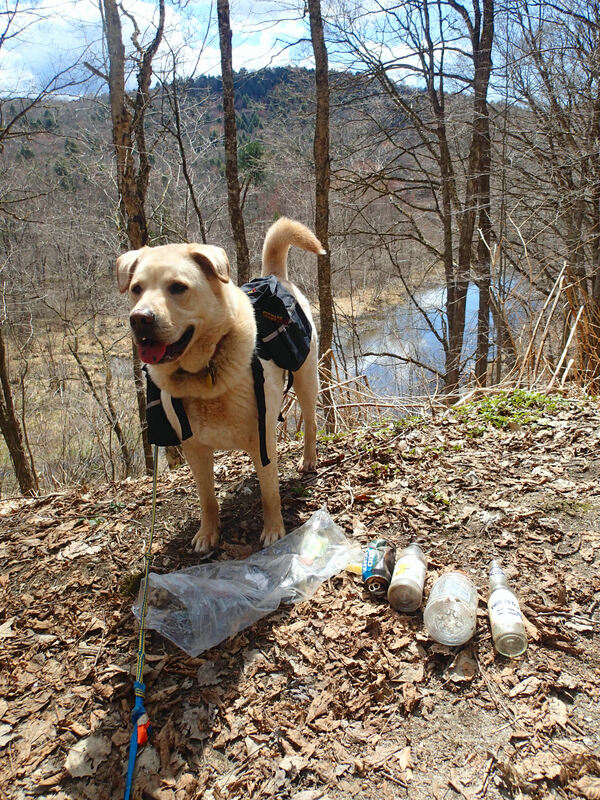 Recently, we participated once again in Vermont’s annual “Green Up Day”…Griff and I checked around those remote canoe camping sites on Waterbury Reservoir which can be accessed by land trail, and removed the trash that we found. Edgar did “Poo Crew” duty at Kirchner Woods, and was pleased to report that debris (and dog poo) was nearly nonexistent…maybe we can make a difference! Best best of all…and the most anticipated day of the year…the first time in 2015 that we dip the paddle in the water! Gryphon and I took the new solo Wenonah out on Friday morning…80 degrees , calm winds, and bluebird skies…I knew this was the day for the maiden voyage. I managed to load the boat onto the car roof (by myself), and secure it to the racks. Once at the parking area, it was unloaded successfully, and placed on the canoe dolly, for the one-third mile carry to the water’s edge. All went well , except for one near land-capsizing when we encountered a small sinkhole, but generally, I was quite pleased. Gryphon was very anxious to hop right into the boat…. Griff remembered exactly what to do, and he happily went into the boat on command. I managed to push off, and off we went, startling a few mallards in the nearby marshes. The canoe handled beautifully! I experimented with both my Bending Branches bent-shaft paddle, as well as a double-bladed kayak paddle. Both paddles seem to have positive features, and I suspect for a while yet, I will continue to keep both paddles as an option…then I may make a decision as to my preference. We had a lovely time, paddling around our familiar reservoir…which until recently, was ice and snow-covered. I am convinced that Griff and I ( and of course, Edgar,too) will have some great paddling trips, and camping expeditions, using this little canoe. 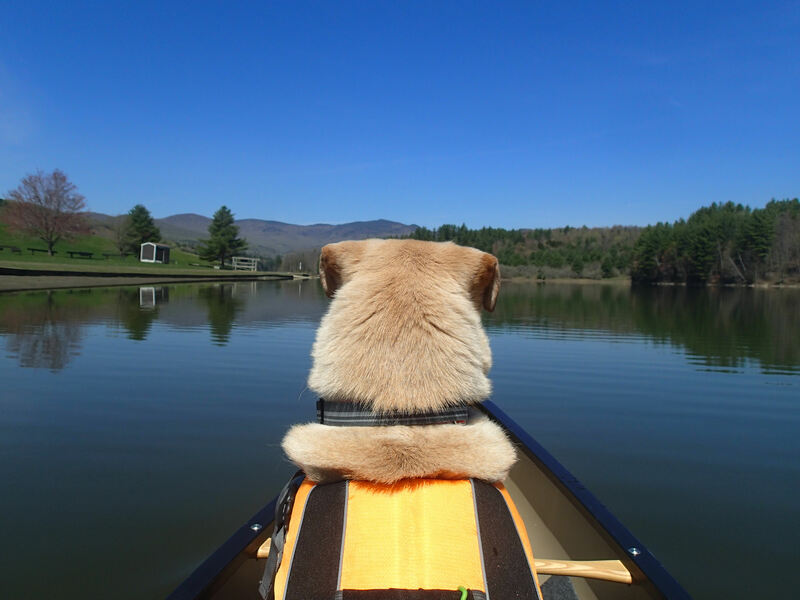 Of course, now my husband is considering that maybe he should get a kayak, to allow him to solo boat with Edgar. Saturday was also predicted to be warm, so we decided to take a short trip to Wolcott Pond, a small quiet pond which seemed the perfect place to make our first tandem foray of the season. As we drove towards the launch site, we could see that it had recently rained…and we could see falling rain off in the distance. The wind was heading right down the lake, kicking up some small waves.…nothing terrible ,but this was our first trip of the year, and we wanted it to be a smooth one. We decided to head out, and are we ever glad we did! The rain showers moved away, the sun came out, and the wind dropped to negligible force…. It was a great first paddle of the year. 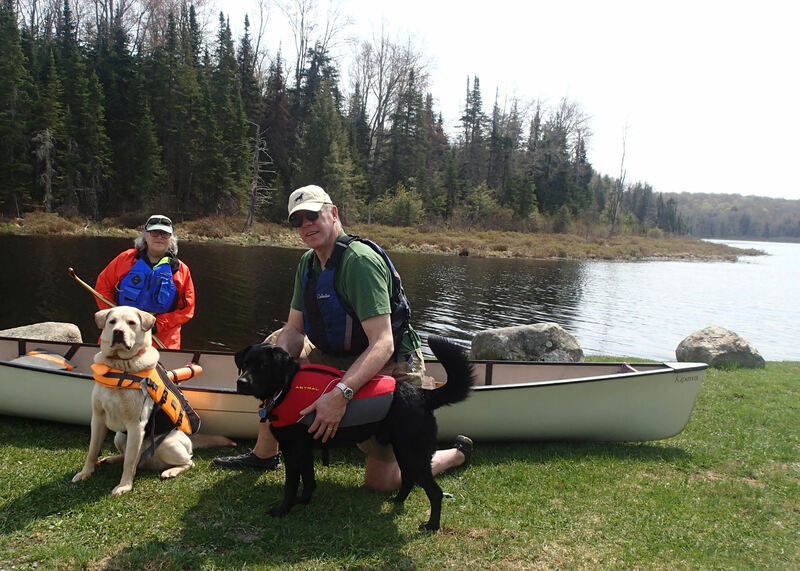 The dogs behaved like the seasoned pros they are, the paddling was smooth and easy, and we had the lake to ourselves. We saw quite a few ducks, some geese, a raven..and off in the distance, some curious splashing in the water. We suspected it may be beavers, but as we paddled around the east side of the lake, we saw a beautiful pair of loons, our first sightings of the year. A third loon was also seen, but we do not know if he is solitary, or we just did not see his mate. It was great to see out paddling companions once again! I think I see a loon…..
We are now in full “where can we paddle next?” mode…anticipating trying out lots of new paddling locations this year, and having more great canoe camping adventures. 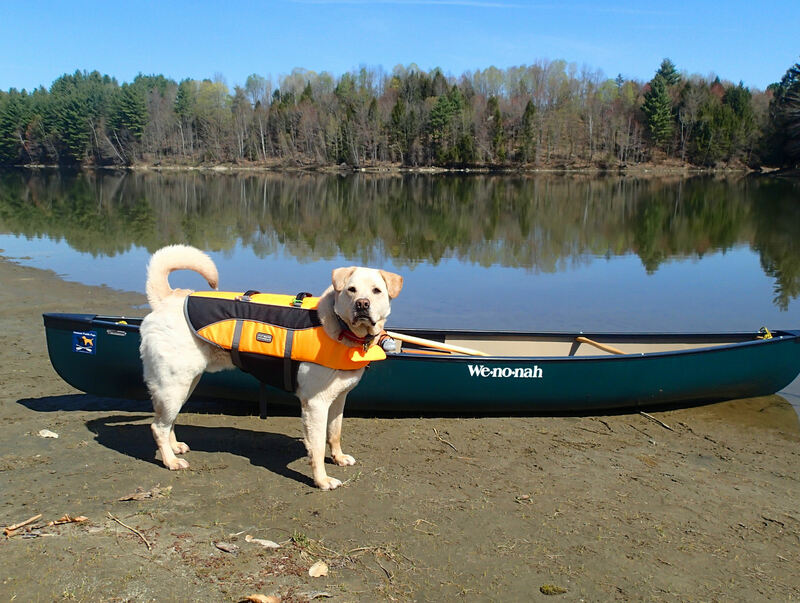 We’ll be getting more gear from Backcountryk9.com to test and review…in addition, a basic primer on Paddling with Your Dogs that I wrote for the Backcountry k-9 blog should be released soon. 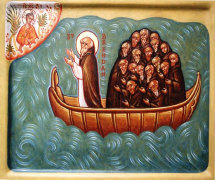 So we close today’s blog entry with a portion of the prayer of St. Brendan, patron saint of canoeists….for us, in our little canoes on little waters, as well as for others, who may be engaged in greater challenges on the water. ← Promising Premonitions of Paddling! Oh my! Your page was really awesome to read. Back in November of 2014, I found my self wanting a puppy. At the time i was considering purchasing one and thought I wanted a little blue nose pit, and then Red showed up. The kids instantly brought him to me showing him off. A few weeks later and his puppyness faded and that’s when it happened. At first I was a bit resistant, crazy dog that he was, then I started working with him, some how, he became my dog and when the kids argued with me, I quickly reminded them that when he made a mess they were more then happy to declare “YOUR DOG!” to me. So, I have a Red…he’s an adorable mutt puppy and we have some really great beginner adventures. Would you believe to begin with the poor pup was car sick….couldn’t even handle a trip to the park! At any rate! We have began our adventures, so far, 4 weekends in a row camping. He has gotten to the point that anytime I go towards the car, he hops in….lol. 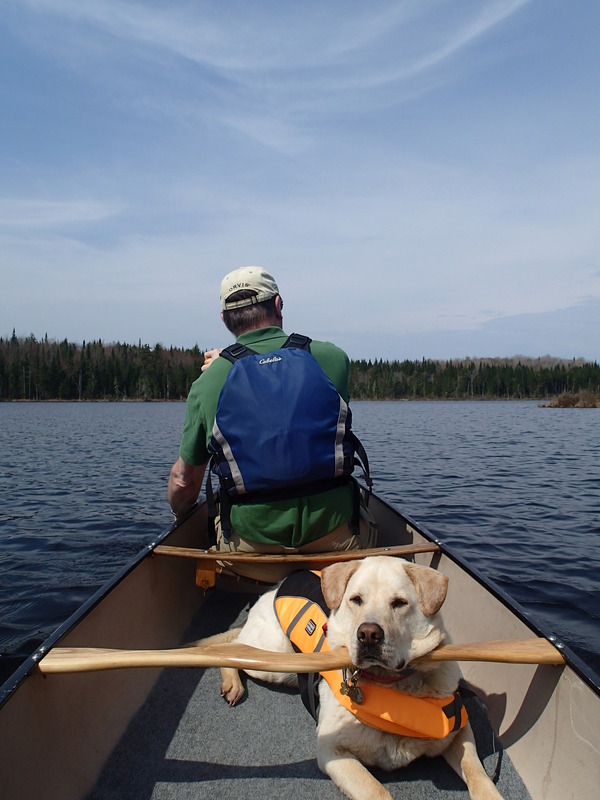 I really want to learn about canoeing and it was really great to read your page. I think for this summer we are going to focus on the hiking and camping. Our first 3 hour hike had him stopping in the middle of the woods. Glad you enjoyed it! Mutts are the best, in my humble opinion….have a great summer of adventures!